My eleven year-old daughter and I spent a recent Sunday afternoon in a local laser tag facility. We were on opposing teams and so we hid from each other in dark corners, cramped down low to prevent our flashing vests from revealing our location as we waited in stillness and silence for the moment we could take the other by surprise with a well-aimed shot to the chest. It was great fun made even better by the fact that my daughter’s birth mom and two birth siblings were playing with us. Our family of six visits with her birth family at least once a year and, after the last visit which was filled with the whining and immaturity of her little brothers, my daughter had requested the next visit be made by just the two of us. After laser tag, we walked to a nearby restaurant chain and dipped bread in our soup as we relived the funnier moments of the game. Five of us was a tight fit for the booth we had chosen to sit at, so I pulled a chair up to the end of the table while my daughter sat next to her 16 year-old birth sister, her 12 year-old birth brother and birth mother sitting opposite them. It was a good viewing area. After a while, I leaned back in my chair and watched the four of them share pieces of themselves with each other–current favorite songs, school subjects they dislike, their surprising shared interest in the latest My Little Pony series. I saw my daughter’s speech patterns in her birth mother’s conversation. I saw that her birth brother—practically a twin in age and appearance–has grown tall this past year and has developed a hilarious sense of humor. I saw that her birth sister has reached a new level of confidence that makes her more approachable than ever. And, for just a moment, I saw them as a family with me, the outsider, watching them through a curtained window from where I stood on their front porch. I loved that moment. I love it even now as I relive it. She sees them as her family, but it doesn’t take anything away from her sense of belonging and security in her adoptive family, the only family she’s lived with since birth. I love that she feels so secure in our relationship that she can feel free to love her birth family without fear of hurting me. She’s only eleven. Maybe she doesn’t think about it like so many others do, like I had worried she might—like love is limited, like loving her birth mom would take away from what she has to give me. Maybe she never will think about love that way. I hope not. I want to be a good mom with all that I am, and yet I fear daily that I will miss the mark of this goal. How do I teach such complex things like the limitlessness of love? Especially when I don’t understand it myself. I wasn’t taught how to be a good mother. Every day, I feel like I’m winging this most important mission in my life. It has taken me many, many years to stop being angry at my mom for not mothering me the way I needed her to. For not letting me know she is proud of my accomplishments and my character. For not telling me know I am loved even when I mess up. For not asking me about my fears and dreams, even my favorite book or color. For not knowing me, the deep parts of me that I share with only those who have earned the right. I still find myself wanting her mothering, but most of the time I keep my expectations in line with what I know she can give. Instead, I now spend more time fretting about being a good mother to my own growing kids. Driving home from our visit with her birth family, my daughter sat behind me in the mini van. She complained when she discovered her ipod’s battery was dead and she hadn’t brought the car charger along. “I guess we’ll just have to talk to each other,” I said. She rolled her eyes but was very open to emptying her mind of her thoughts that afternoon. She talked about her birth father who we haven’t seen in a couple of years. I asked her how she feels about the fact that she was the only child her birth mom made an adoption plan for. She told me about a boy she likes. On that night, it was the boy that she really wanted to talk about, I could tell by the hesitation, maybe embarrassment, in her voice. “You can talk to me about anything, you know. Even if you’re embarrassed or scared or angry. Even if you’re worried about how I will react to what you say. I won’t tease you. I will always listen. No matter what, you can talk to me about anything.” As I said these words to her, I wondered if they were coming from my own hurt adolescence, words yearned for by that eleven year-old I once was. “Yes, I do,” I said to my little girl, who has a young woman’s body and, I realize now, a very mature mind too. A tangle of emotions prevented me from knowing the best way a mother would respond to a daughter in this situation. I said simply, “I love you.” She repeated those three words to me, and we were silent the rest of the drive home. 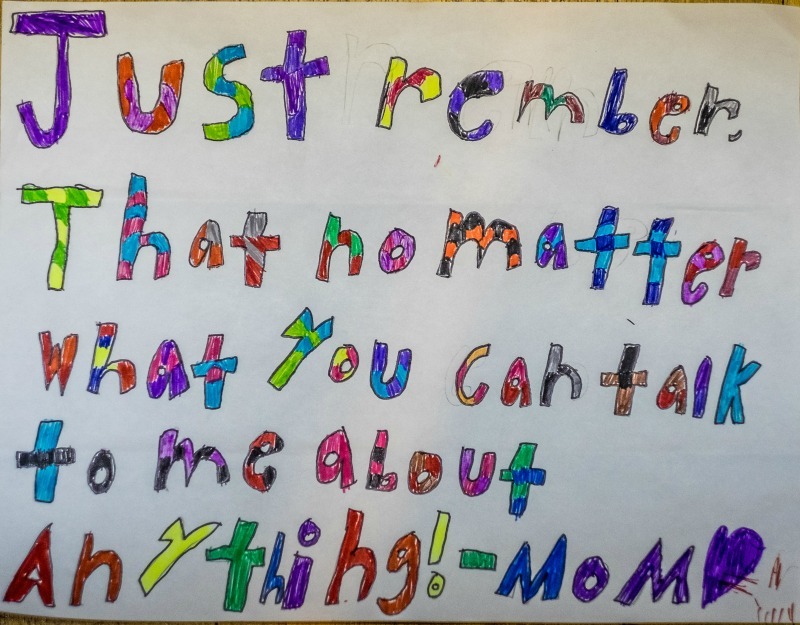 The next day, while she was at school and I was putting clean laundry in her room, I saw a sign she had made and tacked to her bedroom wall (see photo above). For a fleeting moment, I thought “Wow, I AM a good mom.” That thought was quickly replaced with, “No, she is just an amazing girl.” Then the calming presence of truth settled within me, and I knew that instead of it being about me or my daughter, it was about our God. I had caught a glimpse of the Lord working in each of us, mother and daughter, showing us how to be good to each other. And I felt gratitude deep within me for the gift of that knowing. When I think back to my mom’s comment, “I always feel better after talking to you. You calm me right down,” I realize that He is working in my mom and me, too. It is through the talking—and the listening—that we are getting to know each other, to appreciate each other, to reveal a bit of ourselves to each other. The Lord is teaching me that the big things like forgiveness, trust, and unconditional love are developed though the small steps of conversation. And while it is the big things that I yearn for, they will come if I take the small steps. In the meantime, I should remember that, no matter what, I can talk to Him about anything. This is so beautiful, just like you are. It made me cry! Good moms let God do a lot of work and trust Him with their kids. I know you do that! I have do many of the same worries and thoughts you spoke of here. Thank you for sharing. My babies are aged 24 and 12. Time goes by fesatr as you get older. Now that I am 43, time goes even fesatr than ever before, and in all reality I want it to go slower than ever before. I vowed to myself that I will find joy in every single day, for the rest of my life even in the worst of times.It’s a cliche, but yes, every day is a gift.